It is common in the Orthodox Church to make special requests for the service of Moliebens and Panikhidas. A Molieben is an intercessory service conducted by a priest, asking our Saviour, the Mother of God, or one of the saints for assistance with a specific matter (e.g. illness, family difficulties, employment, travel, etc.). This service can be offered in behalf of the living (Orthodox and non-Orthodox). This type of supplicatory service is known as a Paraklisis in the Greek Orthodox Church. A Panikhida is a prayer service offered by a priest for the repose of the soul of an Orthodox Christian who has departed this life. 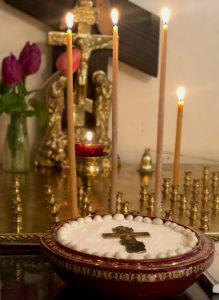 Customarily a Panikhida is served on the third, ninth, and fortieth day after the repose of the Orthodox Christian, and every year on the anniversary of the repose. The Panikhida is essentially the same as memorial services offered in Orthodox Churches outside the Russian tradition, known variously as the parastas, pannychis, or in abbreviated form as the “Trisagion for the Dead.” Only departed Orthodox Christians are commemorated at a Panikhida. This symbolism has its highest expression in the Saints, whose blessed state in heaven have been manifested to the world. For this reason, Koliva is blessed not only at memorials for the departed, but also at times in commemoration of saints. Gwen on Temple Design Completed! Ron Medinger on Temple Design Completed! Keith R. Starkey on The Orthodox Church – the True Church? © 2019 Archangel Gabriel Orthodox Church | All Rights Reserved.